It’s always been our dream that the never-ending argument of which reel is better, the baitcaster or the spinning reel, would finally be resolved. Of course, it still rages across the internet and in every tackle shop in the country but is it an argument? 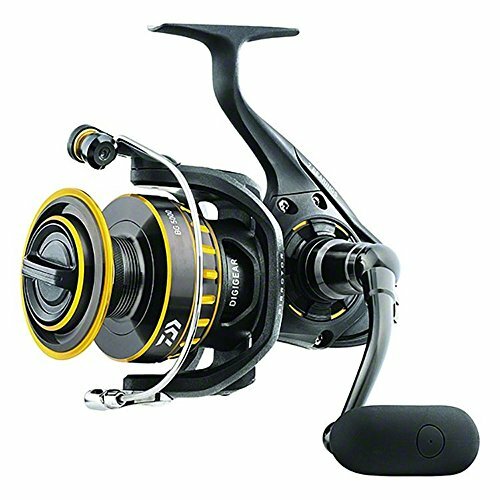 In this article, we will take a look at both types of reels as well as some of our favorite models for each, and discuss the advantages and disadvantages for each. By the end, we hope you realize that each has its strengths in different fishing situations. The baitcast reel sits above the rod with the free spool sitting perpendicular to the length of the rod. This design allows for larger spools which can use heavier line and it also improves the max distance achievable from a cast. Baitcasters are also popular for their fast retrieval speeds and ability to crank in larger fish quickly. Spinning reels sit beneath the rod and have an open, fixed spool that sits in line with the direction of the rod. Click here if you’d like to get a look at some of the better spinning reels available right now. Because of the design of the spinning reel, they have lower gear ratios and lower drag capacities than a baitcaster but are very versatile in presentation techniques and are optimal for lighter tackle and finesse retrieval methods, especially for those who want something more advanced than a spincast reel. 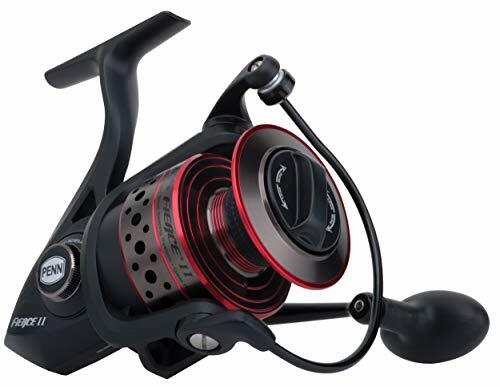 Like most PENN fishing reels, the Fierce II models offer extreme ruggedness with full metal body and side plates as well as an aluminum spool, rotor, and bail. 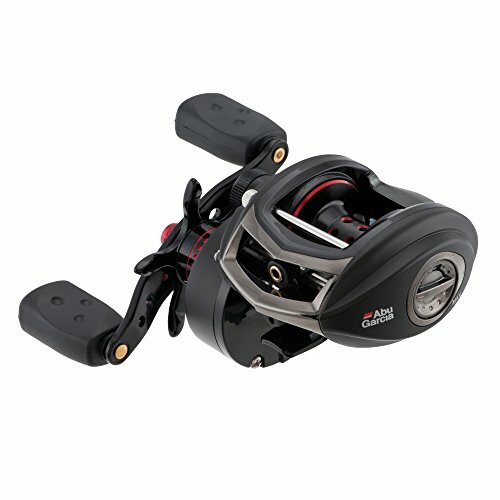 This full metal body design also gives the reel a strong but flexible housing that aids in keeping gears aligned and the reel running smoothly when under heavy cranking pressure while working a large fish. These reels use four high-quality ball bearings that when used in combination with optimized gear placement and their Techno-Balanced rotor, gives you a well-oiled machine on the water. With the faultless oil felt drag system there is not a freshwater fish out there that the Fierce II could not tame. Max drag ranges from 7 to 25lb depending on the model size, but more importantly, you have smooth and fine adjustments of the drag at your fingertips. PS: for PENN’s saltwater reels, check our PENN Warfare review. We also really like the smoothness of casting from these reels. The balanced rotor and line guide does a fantastic job of laying line down evenly and reducing the amount of line twist which goes a long way in getting the most out of your cast. Also, read our PENN Fierce 2 review here. We think that the Revo SX is one of the best starting baitcasters out there. It doesn’t have the steep price tag like a lot of high-end baitcasters, but it has just about the same performance as most of them. There are four models available in the Revo SX line including a right and left-handed model of normal retrieval speed (6.75:1 with 27” retrieval rate) and a model with high retrieval speeds (7.3:1 with 30” retrieval rate). All models are built using the X2-Craftic design which is comprised of an alloy frame that adds ruggedness and corrosion resistance to the reel. We love the drag system on these reels. The star drag is easy to manipulate and gives you fine control over the drag pressure. You do seem to lose some of the finer adjustments near the end of the drag range, but rarely ever would you need 24lb of max drag to work a fish with these reels. The Infini brake system used on these models is one of the best around. It utilizes both a magnetic and centrifugal design that provides consistent resistance to the spool from the beginning to the end of the cast. The bent handle and dual paddle grips are great for cranking out some power, and the D2 Gear Design keeps gears in perfect alignment while under stress. The nine high-quality corrosion resistant ball bearings also play a role in the smoothness of the retrieval you get from these baittcasters. All of the President Spinning Reel models come with a 5.2:1 gear ratio though the retrieval rates differ due to the differences in spool sizes of the reels. Given the number of models that are available in this line of reels, you can have a President to chase after all but the largest fish on the planet. We love the sealed drag system used in the President Spinning Reels. It’s a stacked washer system with stainless steel and oiled felt washers that can dish out some incredible resistance. Of course, max drags vary by the size of the reel, but you have control of the entirety of the drag range. Perhaps the one drawback to this reel is that the rotor isn’t the best at laying line back on the reel. Line twist and knots within the spool tend to pop up more when compared to higher end spinning reels but not near as much as other reels in a similar price range. The retrieval for these reels is silky smooth with 9 (6 in smallest model) corrosion resistant stainless steel ball bearings and a well-designed gear system. The graphite body tends to flex a little when you’re working large and aggressive fish, so you lose a little efficiency in the retrieve but overall, we can’t complain about this reel. The Shimano Citica line of low profile baitcasters is one of the most affordable reels from this highly acclaimed reel maker. There are four models offered that include a left and right-handed option for the normal retrieval speed (6.3:1, 26″ retrieval rate) and a left and right handed option for a high-speed model (7.4:1, 30” retrieval rate). All models feature the Hagane Body that is famous from Shimano and provides one of the most durable and rugged reels on the market. It also provides a stable housing that can withstand flexing from torque generated by you and the fish. On top of the Hagane design, Shimano also uses X-Ship technology which uses two of the five stainless steel ball bearings to keep the pinion and drive gear in perfect alignment. What this means for you is that you are going to have to have a monster on the end of your line to make this reel’s performance falter even slightly under duress. 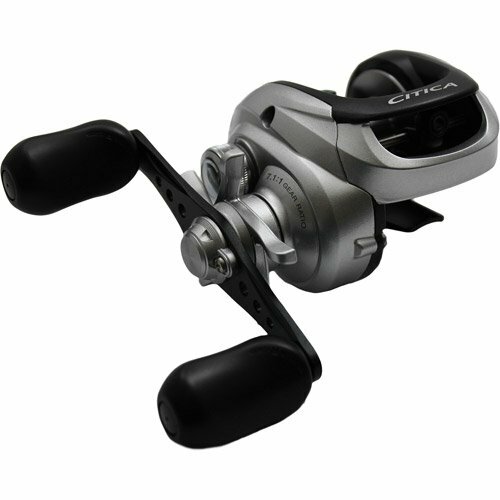 The Citica line from Shimano also offers unparalleled casting from reels in the similar price range. Shimano puts a lot of technology and thought into the design of their spools. With their Super Free Spool design and proper adjustments to tension, you get a tremendous amount of range from light to heavy lures. If you’d like to get your hands on a great Shimano spinning reel, here’s our Shimano Nasci review. The Daiwa BG is one of the most popular spinning reel lines when it comes to serious angling. Gear ratios and line retrieval rates vary from model to model ranging from 5.6:1 and 28.3” per turn for the smallest model to 5.3:1 and 53.3” retrieval rate for the largest model. All of them have fast enough retrieval rates to handle the type of fishing they were designed for. For the body, these are sharp looking reels with black anodized aluminum body and side plates. It’s a terrific housing for the top of the line Digigear gear system used by Daiwa, and all of it results in a reel that can take a tremendous amount of torque and force and keep running smoothly. 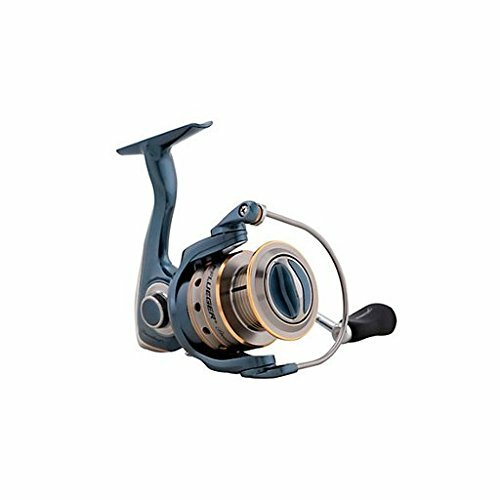 The six quality ball bearings also play a role in the reel’s performance in this regard. As for casting, we’re not sure it gets any better than the Daiwa BG compared to other spinning reels. The rotor design and large spool diameter eliminate the vast majority of line twist that often accompanies spinning reels and greatly improves the casting performance of this reel as line slips off the spool effortlessly. The ATD sealed drag system is also top of the line and has little to no start-up inertia which helps protect lighter lines from vicious strikes. Before we let you go, we do want to take the five reels we have looked and discuss which is our favorites. For the spinning reel, we love the Daiwa BG. From the rugged body to the internal gear design, there is nothing that is going to keep this reel from running at peak performance on the water. Perhaps one of the few spinning reels that come close to the accuracy and smoothness of baitcasters when it comes to casting. For our top choice for a baitcaster, we love the Shimano Citica. The Citica offers incredible performance for an affordable price tag. The Hagane Body and X-Ship technology allow you to generate massive amounts of torque and lift with near perfect efficiency. As far as casting, the spool design and brake system allow you to utilize a huge range of lure sizes effectively and at tremendous ranges. Baitcaster vs spinning reel - a discussion that never ends. Which one is better? In this review we'll make an end to this argument once and for all!